This is a great way to serve spicy Mexican food while going a little lighter on fat, sodium and calories. Through a little experimenting I came up with this fajita seasoning mix that adds a lot of flavor to the meal without all of the sodium that the store bought packages contain. Just as an example, one national brand packet I read had 260 milligrams of sodium per serving, and the package stated it would serve 8. It's kind of hard to believe you will get much flavor into your food if that little packet is to actually season enough food for 8 people. It's almost all salt. To make this recipe healthier we included lots of sliced veggies and mixed up a seasoning mixture that is light on salt and loaded with zesty flavors. 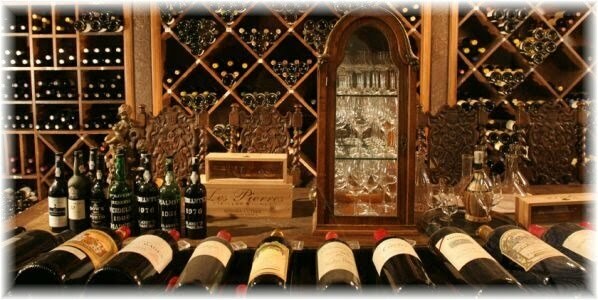 In a small glass bowl combine all ingredients and set aside while you prepare the chicken and vegetables. In a large skillet heat oil over medium-high heat until shimmering. Add the chicken strips to the pan and stir to coat the chicken with the oil. Sprinkle the seasoning mixture over the chicken, reserving 2 teaspoons. Cook the chicken until the edges start to brown, about 3-4 minutes stirring occasionally. Add the onions and peppers to the pan, but do not stir just yet, but cover the pan and allow the veggies to steam for 5 minutes. 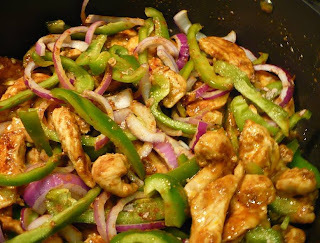 Remove the lid from the pan and sprinkle the veggies with the remaining fajita mixture and stir to combine the veggies and the chicken. Continue cooking for 3-4 minutes until the chicken pieces are no longer pink. 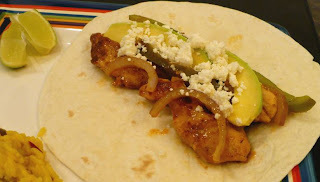 Spoon the mixture onto tortilla shells and sprinkle with Queso Fresco cheese, if desired and serve with a few lime wedges and avocado slices for toppings. Enjoy!! 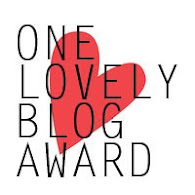 My Liebster Blog Award Nomination! !